The global supply chain market for software and services is on pace to exceed $19B by 2021, surging past $13B this year. The market is fueled by the increased adoption of cloud and SaaS-based platforms and applications. Investments in automating supply chain operations using Internet of Things (IoT) technologies lead all investment categories within the manufacturing operations segment. Projected to generate $105B in spending, it’s followed by freight monitoring ($50B) and production asset management ($45B) according to IDC. The Supply Chain Analytics market is projected to reach $9.87B by 2025, as the need for greater visibility across supply chain networks accelerates in the next several years, according to Grandview Research. One of the most fundamental components of supply chain technology stacks is application and infrastructure middleware. Gartner predicts enterprises will spend $27B this year on these technologies, as supply chain stacks grow beyond individual companies, becoming supply chain network global initiatives. In a recent keynote, Aspire, Challenge and Transform in a Disruptive World, Gartner analysts predicted that 20% of the highest-performing supply chains in the world, the Gartner Supply Chain Top 25, will have Artificial Intelligence and machine learning in pilot phase before the end of this year. In short, there’s a proliferation of new technologies designed specifically to support enterprises that are focused on building new supply chain technology stacks. With so much innovative technology available, it’s tempting to look at a supply chain technology stack as purely an IT-based strategic planning project or program. The most problematic technology stacks start out that way, while the most successful are focused on the customer and more integrative benefits corporate and supply chain network-wide. Designed for knowledge sharing across supplier networks in real-time. The faster and more accurately a supplier network can share a customer order status, forecasts, potential out-of-stock notifications and backlog conditions, the more efficient a supply chain technology stack is. Designing in customer-based data sharing and shared access to the core elements of the data integration, business process, visibility, decision support and strategy layers, including supply chain management planning and analysis, makes an entire supply chain network more effective. Building in customer and supplier visibility across each app, platform, middleware and API component. Staying focused on the need for communicating accurate, insightful and valuable customer data throughout a supply chain and broader network needs to guide the selection for each component comprising a supply chain technology stack. A crucible to test any new technology is to test how it can contribute to the creation and sharing of greater customer knowledge throughout a supply chain network. 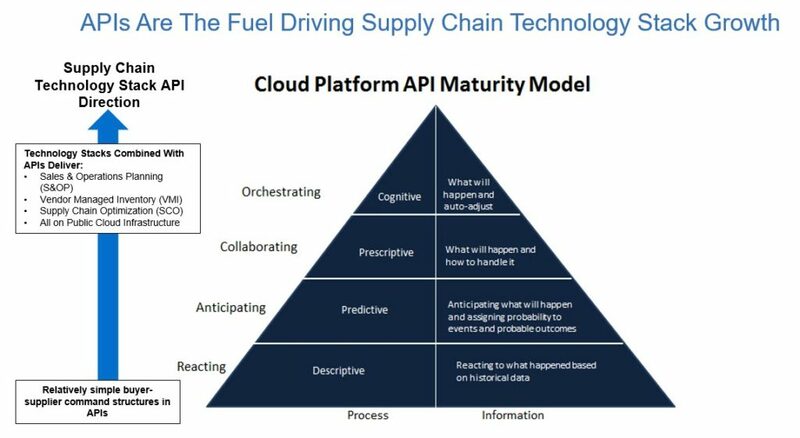 The proliferation of APIs combined with high-performance programming languages is leading to a new era of supply chain technology stacks. The nature of APIs is changing the speed and scale of tech stacks as well. An example is how quickly Sales & Operations Planning (S&OP), Vendor Managed Inventory (VMI) and Supply Chain Optimization (SCO) applications can be integrated and customized into a technology stack. The figure below shows how the quick progression of APIs from basic supplier-buyer interactions to more advanced supply chain functions has a positive impact on the financial performance of a company. The more technology stacks rely on advanced APIs and create stack structures agile and flexible enough to support them, the greater the level of collaboration and coordination across an entire company. When APIs are simplifying and streamlining the most complex supply chain processes, it’s possible to auto-adjust and accomplish more by having real-time data to build strategies on. Using Voice of the Customer (VoC) programs to understand what customers need from supply chain technology stacks beyond EDI or ETL alone. Across all manufacturing industries, customers are rapidly changing how, when and where they buy. Their focus on the buying experience is having a reverberating effect throughout supply chains. The world’s most effective technology stacks are designing greater opportunities for customers to gain the data, insights and knowledge they need in real time. Too often, supply chain technology stacks rely only on EDI or ETL to accomplish this when customers need real-time data to accomplish their goals. Supply chain technology stacks designed to be integral parts of supplier networks last longer and contribute more to revenue growth. The more open the architectures are to supply chain stacks, the greater revenue growth they enable by creating more collaboration opportunities with other supplier networks. According to a study of the leading supply chain networks and their supporting technology stacks, the more open of an architecture a supply chain technology stack has, the faster data can be monetized and turned into additional revenue growth. Sales & Operations Planning (S&OP), Vendor Managed Inventory (VMI) and Supply Chain Optimization (SCO) deliver greater results when integrated throughout a technology stack. The greater the competitive intensity of an industry, the more valuable S&OP, VMI and SCO are to a business. The most effective supply chain technology stacks build in sales and operations planning visibility and support to the inventory level in order to reduce customer wait times for the diverse data needs they have. The more dependent a business is on real-time updates regarding order status, order fulfillment, postponement and logistics, the more essential it is for S&OP, VMI and SCO to be integrated to the technology stack level. Companies win more deals when their supply chain technology stacks support real-time data interchange between customer, Enterprise Resource Planning (ERP) and Supply Chain Planning (SCP) systems. Apparel; high tech consumer electronics; consumer and industrial distributors; and food and beverage companies all rely on postponement and rapid inventory turns to stay profitable and grow their business. Only by having an agile, open supply chain technology stack can companies in these industries stay at a high level of competitive intensity and win deals. It’s the supply chains of these very competitive industries that win them deals by delivering products on time at a profitable price. As supply chain technology stacks become more complex, diverse and defined by legacy system integrations, Application Programming Interfaces (APIs) become essential to making stacks scale to new business models. 2017 is the year of the API economy, as new business models drive entirely new APIs that provide greater speed, scale and simplicity to managing supply chain stacks and applications. The six key success factors underscore how essential agility, contextual intelligence, real-time data integration, speed and scale are to making supply chain technology stacks contribute to revenue growth. 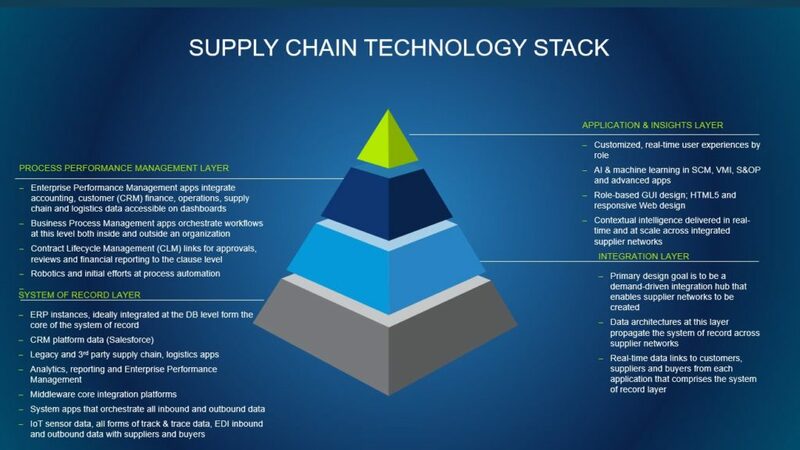 The following image shows the framework for a supply chain technology stack. APIs are the glue that enable each layer to communicate, collaborate and create greater contextual intelligence of customer, buyer and supplier interactions. This is the foundation for the stack as it fuels the baseline data used for measuring how effective supply chain operations are in meeting customer expectations and needs. The system of record is also where the middleware applications, which also unify specific processes up and down the stack, are based. Legacy and 3rd-party applications, often designed to support the business models an organization has abandoned, are also at this layer. The goal of the system of record layer is to aggregate a diverse base of data from legacy and future data collection technologies, including IoT sensors and track and trace data. Data aggregation is also performed through the integration layer of the stack, used for improving process performance and bringing greater contextual intelligence to the application and insights layer. This layer orchestrates integration of core system of record systems and platforms with the process performance, applications and insights layer of the model. This layer is essential for scaling a supply chain technology stack beyond the four walls of a business, enabling it to be part of a supplier network. The primary design goal is to model this layer to be an integration hub across the supply chain, integrating with supplier networks in the future. The process performance management layer defines the workflows and process structures to enable supply chains to operate more efficiently. The focus of this layer is on making processes and workflows efficient through the continual monitoring of metadata generated from each process. Advanced goals for this layer include tracking operational performance in real time, using enterprise performance management combined with accounting and finance data. Supply chain applications are customized to specific roles and user requirements, including support for HTML5 and responsive web design. The goal of this layer is to provide contextual intelligence and insights across the organization. As machine learning and Artificial Intelligence (AI) continue to proliferate in supply chain applications, this layer will increasingly become focused on how best to align those technologies with customer needs. Supply chain technology stacks are going through an inflection point today. The legacy on-premise systems that dominated supply chain management are giving way to cloud-based platforms that are API-enabled. Integrating systems that are foundational to a supply chain’s performance, including ERP, CRM, and SCM, are no longer taking months or years to integrate together.  Now it’s getting done in weeks, given the rapid advances in middleware and cloud integration technologies. The six success factors mentioned in this article are the mile markers of supply chain-centric companies that are growing faster than competitors. By adopting an open architecture for the supply chain technology stack being built, any organization will be able to have their supply chains become collaborators in growing revenues quickly.